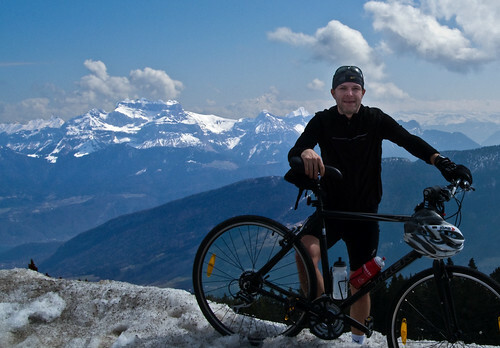 Le Semnoz is featured in my favorite cycling movie: "Le Vélo de Ghislain Lambert." As the ski stations close for the season, now is the perfect time to climb cleared and empty roads. Le Semnoz is the big forested mountain on the west side of Lake Annecy. There are several great routes up – today I took the direct steep route from Annecy – descending the quieter south side via Col de Leschaux (map at bottom). The film features all sorts of classic cycling footage including various one day classic routes, the showers at Paris-Roubaix, Col d’Izoard, Mont Ventoux, and – as part of a fictional Tour stage – Le Semnoz. You can order the movie at Amazon – it comes with english subtitles. A must see for any cyclist fan. This brought back memories as I did this climb last summer after first stumbling on your website. For an overweight mid 40s late into mountain biking, it was a challenge to say the least! As I mentioned in a previous email some months ago, have now managed to book to return for the week of Le Tour. You advised then to get up into the mountains to watch. 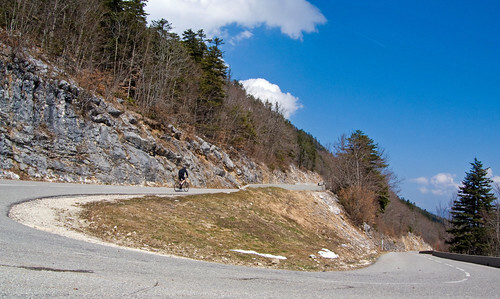 As I have a family of 6 and a VW Transporter, do you know of any suitable lay-bys where I could park up and watch the stage to Le Grand Bornand? Am thouroghly enjoying your weekly updates- an inspiration to us ageing fatties to keep riding. 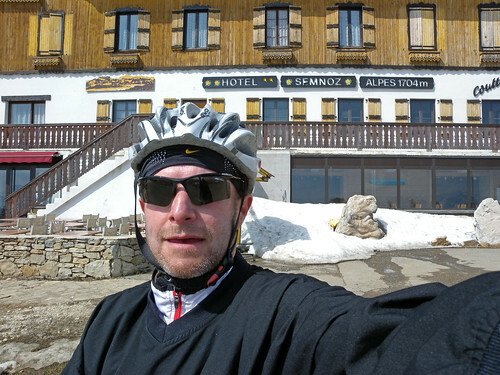 Am entered in Mountain Mayhem- 24hr mountain bike event – in June so hopefully will be in reasonable nick in July to tackle some of the hills again around Annecy. Keep it up! Was not too far from you recently. Just went skiing up in Tignes. Had an excellent time there is something the amazing about the clear open air that really clears you out and makes you feel better. You are lucky to get to cycle around such amazing areas. Good luck with your future cycles. The movie clip was also enjoyable. To drive to the last climb of the 2009 Tour de France stage that ends in Le Grand Bornand with a family? 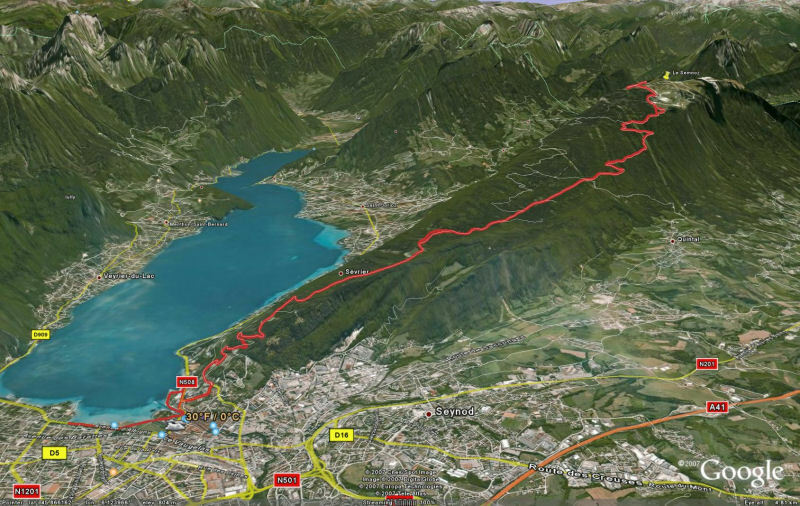 The link to the post below shows the last 2 climbs of the Grand Bornand stage. The tour will climb Col de la Colombier from Cluses via Romme, then descend to Reposoir and then climb to the top of Colombiere, then finally descend to Le Grand Bornand. With a big family you could try and drive to Reposoir (either from Grand Bornand if the roads aren’t closed, or from Scionzier (see the map again) taking the normal road up Colombier from Cluses. The last time the Tour climbed here, Reposoir had big fields set aside for parking, and lots of festivities. You could park there with the family and walk up some more or just enjoy the town. Note, it would be very important to be there EARLY (several hours at least) to ensure the roads are open to cars. Bring a picnic and enjoy the fun, but expect a long day.